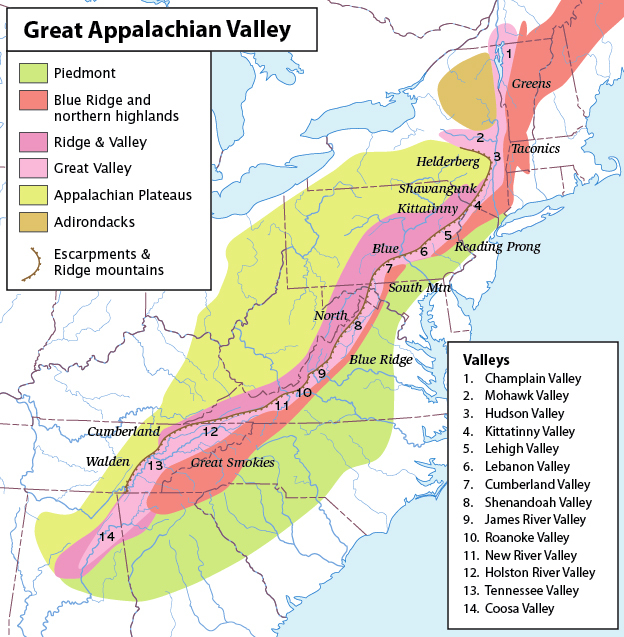 The Great Valley, also known as the Great Appalachian Valley or Great Valley Region, is one of the major landform features of eastern North America. It is a gigantic trough — a chain of valley lowlands — and the central feature of the Appalachian Mountain system. The trough stretches about 700 miles from Canada to Alabama and has been an important north-south route of travel since prehistoric times. In its northern section, the Great Valley includes the Lake Champlain lowlands and Champlain Valley, Hudson River Valley, Newburgh Valley, Wallkill Valley, Kittatinny Valley, Lehigh Valley, Lebanon Valley, and Cumberland Valley. A series of mountains bounds the valley to the east, including, from north to south, the Green Mountains of Vermont, the Taconic Mountains, the Reading Prong (which includes the Hudson Highlands, the New York and New Jersey Highlands, Schunemunk Mountain, and the Ramapo Mountains), and South Mountain of Pennsylvania. There is a wide gap between Reading Prong and South Mountain, connecting the Great Valley with the Piedmont region of southeast Pennsylvania. Some sources cite this gap as the dividing point between the northern and southern sections of the Great Valley. Another series of mountains bounds the valley to the west. These are mainly the first major ridges of the Valley and Ridge Appalachians and the western escarpments of the Allegheny Plateaus. They include, from north to south, the Adirondack Mountains, the Catskill Mountains (specifically the Helderberg Escarpment), a long and nearly continuous mountain ridge with several names: Shawangunk Ridge, Kittatinny Mountains, Blue Mountain, stretching from New York through New Jersey to Pennsylvania. This long mountain continues into Virginia with the name North Mountain. These mountains on the west side of the Great Valley are broken by the gap of Mohawk Valley in New York, which connects the Hudson River Valley with the lowlands south of Lake Ontario. The long Kittatinny-Blue-North Mountain is broken by a few narrow wind and water gaps, such as the Delaware Water Gap, Pennsylvania Wind Gap, Lehigh River Gap, Schuylkill River Gap, Swatara Gap, the Susquehanna River Gap, Big Gap, and, farther south, the Potomac River Gap. In its southern section, the Great Valley is bounded to the east by the Blue Ridge Mountains, which extend north into Pennsylvania as South Mountain. Regional names of the southern Great Valley include Hagerstown Valley in Maryland, Winchester Valley and Shenandoah Valley in Virginia and West Virginia, the upper valley of the James River, Roanoke Valley, and New River Valley in Virginia, the Holston River Valley in Virginia and Tennessee, and the East Tennessee Valley extending from Virginia through Tennessee to Alabama. Some sources describe the Coosa River Valley as the southernmost part of the Great Valley. These southern portions of the Great Valley are sometimes grouped into two parts, the Valley of Virginia and the Tennessee Valley. The southern Great Valley is bounded on the east by the Blue Ridge physiographic province, which includes, from north to south, South Mountain in Pennsylvania, Catoctin Mountain in Maryland and Virginia, the Blue Ridge of Virginia, the Black Mountains of Virginia and North Carolina, Holston Mountain in Tennessee, the Unaka Range and the Great Smoky Mountains of Tennessee and North Carolina. An important gap in these mountains occurs near Roanoke, Virginia. Other gaps of note in the Blue Ridge of Virginia, connecting the Piedmont region with the Great Valley include Thornton Gap, Swift Run Gap, and Rockfish Gap. Another series of mountains bounds the southern Great Valley to the west, including North Mountain and Great North Mountain, the Allegheny Front, Powell Mountain, Cumberland Mountains, Walden Ridge, and the Cumberland Plateau. The Cumberland Gap connects the Great Valley region with Kentucky and Tennessee lands to the west. Massanutten Mountain lies in the middle of the Valley of Virginia portion of the Great Valley. The Valley of Virginia is a region of karst, with many sinkholes and caverns. For white immigrants the Great Valley was a major route for settlement and commerce in the United States along the Great Wagon Road, which began in Philadelphia. In the Shenandoah Valley the road was known as the Valley Pike. The Wilderness Road branched off from the Great Wagon Road at present-day Roanoke, Virginia crossed the Cumberland Gap and led to Kentucky and Tennessee, especially the fertile Bluegrass region and Nashville Basin. Another branch at Roanoke, called the Carolina Road, led into the Piedmont regions of North Carolina, South Carolina, and Georgia. The various gaps connecting the Great Valley to lands to the east and west have played important roles in American history. On the east side, the wide gap in southeast Pennsylvania became the main route for colonization of the Great Valley. By the 1730s the Pennsylvanian Great Valley west of South Mountain was open to settlement after treaty cessions and purchases from the Indians. The region drew a steady and growing stream of immigrants and became known as "the best poor man's country". Before long immigrations had thoroughly settled the Great Valley in Pennsylvania and were rapidly migrating and settling southwards into the Shenandoah Valley of Virginia. The entire region between southeast Pennsylvania and the Shenandoah Valley soon became famous as a "breadbasket", the most productive mixed farming region in America (Meinig, 1986:134). The road from Philadelphia west to the valley and then south through it became very heavily used and known variously as the Great Wagon Road, the Philadelphia Wagon Road, the Valley Road, etc. The conestoga wagon was developed around 1725 in the area of the wide opening between Philadelphia and the Great Valley. The conestoga wagon became the main vehicle for transportation through the Great Valley until the railroad era. By the 1750s the Great Valley was well-settled to the southern end of Shenandoah Valley. Immigrants continued to travel from the Philadelphia area south through the Great Valley beyond Shenandoah, to the vicinity of the modern city of Roanoke, Virginia. There is a wide gap in the Blue Ridge near Roanoke. A branch of the Great Wagon Road began there, crossing through the gap east into the Piedmont region of North Carolina and South Carolina. This road became known as the Carolina Road. During the 1750s the stream of migrants traveling south through the valley and into the Carolina Piedmont grew into a flood. At the time, the Carolina Piedmont region offered some of the best land at the lowest prices. Soon a string of towns appeared, including Salisbury, Salem, and Charlotte in North Carolina. In the decades before the American Revolution the Piedmont "upcountry" of the Carolinas was quickly settled, mostly by recent immigrants who had migrated from the north to the south via the Great Valley. Many of these immigrants were Scots-Irish, Germans from the Rhineland-Palatinate area, and Moravians. This "upcountry" population soon surpassed the older and more established "lowcountry" population near the Atlantic coast, causing serious geopolitical tensions in the Carolinas during the late 18th century (Meinig, 1986: 291-293). The Great Valley played an important role during the American Civil War, especially the Shenandoah Valley, its Blue Ridge gaps and nearby Piedmont area, and its northward extension to the vicinity of Gettysburg. Civil War era sites and events in this region include Harpers Ferry, Antietam, Manassas, Virginia, Chambersburg, Pennsylvania,Valley Campaign, Valley Campaigns of 1864, Battles of Chattanooga, and Gettysburg Campaign. Evans, the film's executive producer, writes that book and film provide "a multifaceted glimpse [of] the history of Appalachia: who came to the land, why they came, what they found, what they did, and why they stayed." Former Rolling Stone Press editor George-Warren presents a "Hillbilly Timeline" from 1900 to 2000. Many of the contributors, among them scholars, writers and naturalists, offer nostalgic childhood memories. [Includes] quotes, images, lyrics, poems, excerpts from 19th-century writing, more than 180 superb photos and illustrations, Archie L. Musick's scratch-board art, song sheets, engravings and R. Crumb drawings. 16 full-pages of color photos. Spanning film, literature, and the entire expanse of American popular culture, from D. W. Griffith to hillbilly music to the Internet, Harkins illustrates how the image of the hillbilly has consistently served as both a marker of social derision and regional pride. He traces the corresponding changes in representations of the hillbilly from late-nineteenth century America, through the great Depression, the mass migrations of Southern Appalachians in the 1940s and 1950s, the War on Poverty in the mid 1960s, and to the present day. Harkins also argues that images of hillbillies have played a critical role in the construction of whiteness and modernity in twentieth century America. Richly illustrated with dozens of photographs, drawings, and film and television stills, this unique book stands as a testament to the enduring place of the hillbilly in the American imagination. He depicts the evolution of a backwoods farm-and-forest society, its divided and unhappy fate during the Civil War, and the emergence of a new industrial order as railroads, towns, and extractive industries penetrated deeper and deeper into the mountains. Finally, he considers Appalachia's fate in the twentieth century, when it became the first American region to suffer widespread deindustrialization, and examines the partial renewal created by federal intervention and a small but significant wave of in-migration. Sources: Appalachian Topography - Paleontological Research Institution; Appalachian Mountains - Columbia Gazetteer of North America; USGS - Valley and Ridge Province; Pennsylvania Geology Map; Geological Structure of Pennsylvania; Drake, Richard B. (2001), A History of Appalachia. Lexington: The University Press of Kentucky; Kercheval, Samuel (1850), A History of the Valley of Virginia, Woodstock, Virginia -- History (much of it anecdotal) of the colonial Virginia northern frontier; Meinig, D.W. (1986), The Shaping of America - A Geographical Perspective on 500 Years of History, Volume 1 - Atlantic America, 1492-1800. New Haven: Yale University Press; Williams, John Alexander (2002), Appalachia - A History. Chapel Hill: University of North Carolina Press.